Once again, manufacturing history is being made at Sewanhaka High School in Floral Park, New York. Back in the 1940s, Sewanhaka helped train young men and women as technicians for the aircraft industry on Long Island and also to meet post-war industrial needs. Today, high school students here are developing the skills required in our country’s new manufacturing economy — empowered by digital fabrication technology from ShopBot. Jack Chen, a former manufacturing engineer, is now in his third year as a high school teacher — and he’s passionate about it. He’s the instructor for the Instrumentation and Automation (I&A) program which is a three year pre-engineering elective available to students in the Sewanhaka Central School District through its Career & Technical Education Center. Besides I&A, the Career and Technical Education Center at Sewanhaka High School also offers courses in Architectural Technology, Automotive Technology, Construction Trades, Cosmetology/Beauty Culture, Graphic Design, Corporate Communications/Digital Imaging and classes to help students prepare for Networking and A+ Computer Technician Certification. 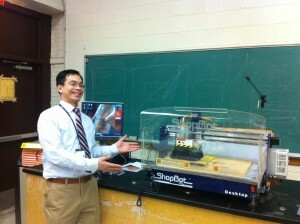 We’re excited to shed a spotlight on Jack and his teaching at Sewanhaka — in part because he is one of the teachers (the first, actually) to take advantage of the ShopBot “Digital Fab Tools for Schools” promotion held in collaboration with Autodesk 123D Design; he’s poised to use his ShopBot Desktop in his class as well as in collaboration with other teachers in the school. Jack earned his B.S. in Mechanical Engineering from Cornell University, M.S. in Mechanical Engineering at Case Western Reserve University and an MBA from Georgetown University. After working for a number of years in engineering and in business, Jack answered the national call for more highly-qualified math and science teachers in our country’s public schools by applying for a five-year teaching fellowship offered by Math for America that allowed him to earn his Master of Arts in Teaching from Bard College and to begin his teaching career at Sewanhaka High School. Most of Jack’s students at Sewanhaka are college-bound; an overview of his program reveals that 10th graders get a half-year concentration in computer science and a half-year of electronics; 11th graders learn about applied electronics with programmable micro-controllers by building small robots and various automated devices; 12th grade students study physics at the advanced placement level.